By choosing a pre-engineered steel barn, you buy into the promise of superior shelter and sanitary conditions for your animals – at an affordable price. 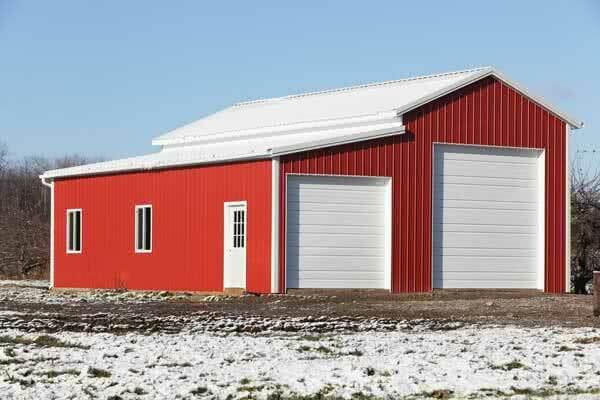 Steel is fast becoming the building material of choice for barns and agricultural storage sheds for farmers throughout North America. 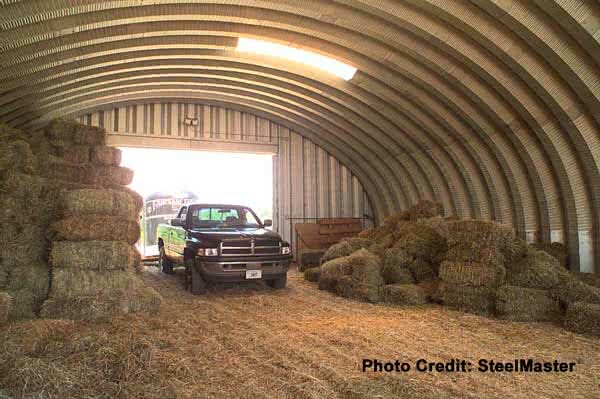 Traditionally built as shelter for animals and crops, barns are also being revolutionized as multipurpose structures providing space for workshops, studios, or even vehicle storage. As one of the strongest construction materials on the market, steel offers secure protection for whatever you choose to store inside. Strength: Steel has an incredibly high strength to weight ratio, and is one the strongest and most durable construction materials on the market. Strong enough to withstand hurricanes, gale-force winds and even tornadoes, a steel barn proves top-of-the-line protection against harsh weather and damaging sunrays. With a steel horse barn kit building, you can rest assured knowing your animals are in the best shelter available. Kick Proof: The high strength of steel means the material can hold up to animals kicking the walls. At the same time, steel’s flexibility provides a degree of give, preventing fractures in animals’ legs. Fire and Termite Resistant: Steel is a non-combustible material, and therefore is highly sought after in barn construction in helping to protect animals from the dangers of fire. Compared to wood, steel is also resistant to termite damage. Low Cost: Any DIY enthusiast can assemble a pre-engineered steel barn with help from family and friends. Choosing a pre-engineered steel barn is one of the most economical options in barn construction on the market. By choosing steel, a low-cost alternative to lumber, you can expect to save between 35-45% on both material and erection costs. A steel barn is also highly resistant to decay, mildew and rust due to its zinc and aluminum alloy coating, and will result in lower maintenance costs over time. Versatility: Steel building kits can be used for a variety of purposes, from housing livestock to storing antique vehicles, providing workshop space for DIY projects or auto maintenance, a living space or an additional guest room. If the roof is trussed, this provides additional interior space without supports, further enhancing the multipurpose flexibility of a steel barn. Speed: DIY assembly can be completed quickly and easily, and will be ready in no time to be put into operation. Typically, kit buildings can be erected in a matter of a few days with limited tools and manpower. Green: Steel is a recyclable material, and most manufactured steel today contains an average of 25% recycled content. Choosing steel for your barn saves landfill space and valuable resources and is considered a GREEN building alternative. Look out! When a large animal kicks through wood, there’s the potential for serious splinters. Or when a horse or cow kicks a wall of brick or masonry they can break a leg. Not so with metal panels – they’re strong enough not to break; and flexible enough to provide some give, rather than causing injury. Plus, animals won’t chew on metal. It’s indisputable, metal barn kits are the affordable, intelligent choice for those who practice serious animal husbandry. 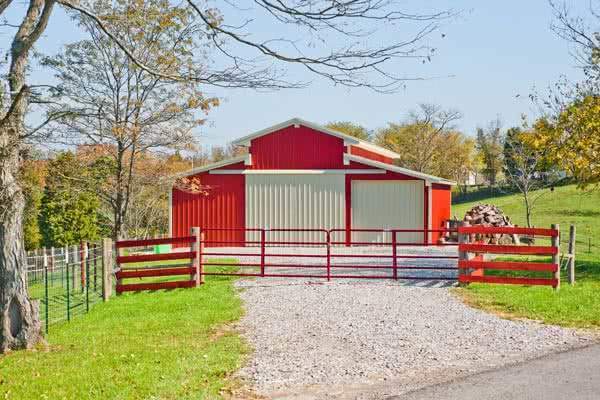 Size: As the primary purpose of a barn is to house livestock, it is necessary to provide ample space for the animals to be able to move. Insufficient room can cause animals to develop serious health problems, and for poultry and swine can even lead to cannibalism. 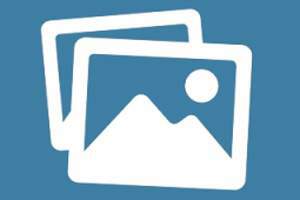 A large, mature horse (mare or gelding) requires a box stall size of at least 12 feet by 12 feet, or a tie stall size of at least 5 feet by 12 feet. A stallion requires a box stall at least 14 feet by 14 feet, as well as a two to four-acre paddock for exercise. A pony requires a 9 feet by 9 feet box stall, or a 3 feet by 6 feet tie stall. Sheep require at least 12 to 16 square feet of space per ewe, or 15 to 20 square feet for both ewe and lamb. For swine, pigs up to 60 lbs. require at least 3 square feet of space each. Pigs between 60 and 126 lbs. require at least 6 square feet each, and pigs over 125 lbs. require at least 8 square feet each. Cattle in a bedded confined barn without a feedlot require at least 30 square feet each per head. In a barn with a feedlot, cattle over 600 lbs. require at least 20 square feet per head, while calves require at least 15 square feet per head. Ventilation: If you plan on keeping livestock inside your barn, ventilation is extremely important for the health and well-being of your animals. Ventilation not only helps for cooling of your pre-engineered steel barn, but also helps to remove disease-causing pathogens, dust, and can help to control moisture buildup and prevent mold forming inside the structure. The simplest way to incorporate natural ventilation is with strategically placed windows. Take into consideration the direction of prevailing winds when laying out the design of your steel barn building, to allow for cross ventilation. However, take extra precautions to not place livestock near windows as direct drafts can cause illness, like pneumonia. Other ventilation options can include louvered and turbine vents. Ventilating the roof if you are building an insulated and heated barn is necessary to avoid ice buildup. The average barn, about 30 feet wide, 20 feet long and eight feet tall, requires a ventilation system capable of changing 320 cubic feet of air per minute. In the sweltering summer heat, air may need to be changed at ten times this rate.